Institute for Plasma Research (IPR) has published an advertisement for Recruitment for Junior Research Fellow (JRF) Post 2019. Application mode is online. Interested candidate can apply online through the official website – www.ipr.res.in. Interested candidates are requested to apply online through official website before the last date. Interested candidates can apply online from 07 April to 20 April 2019 through IPR official website. You can check more details like educational qualification, selection process & how to apply in below given official notification. Institute for Plasma Research (IPR) has published an advertisement for the Recruitment of Tradesman, Technician, Scientific Officer and Scientific Assistant Posts 2019. There are 44 vacant seats are available. Application mode is offline. Interested candidate can send their application form to given address as per required documents are given in Advt. before the last date. For more information related to IPR check official website of it. You can check more details like educational qualification, selection process & how to apply in below given official notification. Institute of Plasma Research (IPR) Gandhinagar has published an advertisement for the Recruitment of Medical Officer Post 2018. There are 01 vacant seats are available for Medical Officer Post. Application mode is offline. Interested candidate can send their application form to given address as per required documents are given in Advt. before the last date 24 January 2019. For more information related to IPR check official website of it. You can check more details like educational qualification, selection process & how to apply in below given official notification. Institute of Plasma Research (IPR) has published notification for Recruitment for Hindi Officer Post 2018. There are 01 vacant seats are available. Application mode is online. Interested candidate can apply online through official website. Interested candidates are requested to apply online through official website before the last date. For more information related to IPR check official website of it. You can check more details like educational qualification, selection process & how to apply in below given official notification. Institute of Plasma Research (IPR) has published notification for Recruitment for Project Director Posts 2018. Application mode is offline. Interested candidate can send their application form to given address as per required documents are given in Advt. before the last date by registered post or speed post or Email on director@ipr.res.in. For more information related to Institute of Plasma Research check official website of it. You can check more details like educational qualification, selection process & how to apply in below given official notification. Eligible and Interested candidate can send their application form with required documents to given address before the last date by registered post or speed post or Email on director@ipr.res.in. Institute of Plasma Research (IPR) has published notification for Recruitment for Project Scientific Asst., Project Technician & Library Trainee Posts 2018. There are 01 vacant seats are available. Application mode is online. Interested candidate can apply online through official website – www.ipr.res.in. Interested candidates are requested to apply online through official website before the last date. For more information related to IPR check official website of it. You can check more details like educational qualification, selection process & how to apply in below given official notification. Eligible and Interested candidate can apply online through official website – www.ipr.res.in. IPR Jobs: The Institute for Plasma Research is a physics research institute. The institute is recognized internationally for its contributions to fundamental and applied research in plasma physics and associated technologies. The institute is located on the banks of Sabarmati River in Bhat village of Gandhinagar district of Gujarat State and was established in the year 1986. Facilitation Centre for Industrial Plasma Technologies (FCIPT) is a division of Institute for Plasma Research which focuses on technology development for social benefits and industries. All the research the institute is done is environment-friendly and produces high reproductively and reduce time duration cycles. The institute just not only does research but is also providing IPR career opportunities to the deserved candidates. The main agenda of providing jobs to the candidates is to promote and conduct basic and applied studies in the plasma field. They also conduct academics programs to train engineers and scientist. They provide Institute for Plasma Research employment in different positions. If there is any vacant place in any IPR field they will notify you by giving the advertisement in the newspaper and also on their official website. The official website of IPR is www.ipr.res.in. They provide recruitment in fields like Technician Apprentice, ITI Apprentice, Graduate Apprentice, Office Clerk, Junior Research Fellow, Senior Research Fellow, Scientist, Medical officer, etc. If you are willing to apply for any of the Institute for Plasma Research Job then first read the notification of particular job in order to check your eligibility – required education qualification, age, experience, etc. if you are eligible for the post then apply for it based on the available vacancies. In order to apply for the post visit the above-given link (official website of IPR). On the home page, there is an ‘About Us’ tab. Put your cursor over that tab ad clicks on ‘Career’ link and check the available IPR vacancy and apply for the post by following the given instructions. Be in touch with the website to get updated. Gujarat Maritime University (GMU) Gandhinagar had issued Recruitment notification for filling a vacancy of Associate Professor, Assistant Professor and Professor in Law Posts 2019. There are 05 vacant seats are available. Application mode is offline. Interested candidate can send their application form to given address as per required documents are given in Advt. before the last date. For more information related to GMU check official website of it. You can check more details like educational qualification, selection process & how to apply in below given official notification. Kamdhenu University Gandhinagar has published a notification for the Recruitment of Assistant Director of Research, Assistant Director of Extension Education, Associate Professors, Director of Information Technology, University Librarian, Registrar, Deputy Engineer and Veterinary Officers Posts 2019. There are 20 vacant seats are available. Application mode is offline. Interested candidate can send their application form to given address as per required documents are given in Advt. before the last date. For more information related to Kamdhenu University check official website of it. You can check more details like educational qualification, selection process & how to apply in below given official notification. Kamdhenu University Gandhinagar has published a notification for the Recruitment of Senior Research Assistant, Laboratory Technician, Steno Grade-III and Junior Clerk Posts 2019. There are 09 vacant seats are available. Application mode is offline. Interested candidate can send their application form to given address as per required documents are given in Advt. before the last date. For more information related to Kamdhenu University check official website of it. You can check more details like educational qualification, selection process & how to apply in below given official notification. Kendriya Vidyalaya Gandhinagar had issued Recruitment notification for filling a vacancy of Part-Time Contract Teacher Post 2019. Application mode is offline. Interested candidate can attend Walk-in-interview with required documents at the given address at a sharp time. Walk-in-interview for the given post will be organized on 23rd March 2019 at KVS Gandhinagar. You can check more details like educational qualification, selection process & how to apply in below given official notification. Kendriya Vidyalaya Wadsar, Gandhinagar has published an advertisement for Recruitment for PGT, TGT, Computer Instructor, Spoken English Instructor, PRT, Dance Teacher, Games Coach, Teachers of German Language, Doctor, Nurse, Counsellor and Yoga Teacher Posts 2019. Application mode is offline. KVS Wadsar has organized an interview on 14 & 16 March for selection of eligible candidates. Interested candidate can attend Walk-in-interview with required documents at the given address at a sharp time. You can check more details like educational qualification, selection process & how to apply in below given official notification. Guj Info Petro Limited (GIPL) Gandhinagar has published an advertisement for Recruitment for Senior Manager (IT Project), Senior Software Engineer, Software Engineer, SQLDBA and System Analyst Posts 2019. Application mode is online. Interested candidate can apply online through official website – careers.gipl.in. Interested candidates are requested to apply online through official website before the last date. Interested candidates are requested to apply online on or before 24th March 2019. You can check more details like the educational qualification, selection process & how to apply in below given official notification. Gujarat Info. Petro Limited (GIPL) has published notification for Recruitment for Sr. Software Engineer & Software Engineer Posts 2018. Application mode is online. Interested candidate can apply online through official website – careers.gipl.in. Interested candidates are requested to apply online through official website before the last date. For more information related to GIPL check official website of it. You can check more details like educational qualification, selection process & how to apply in below given official notification. Eligible and Interested candidate can apply online through official website – careers.gipl.in. 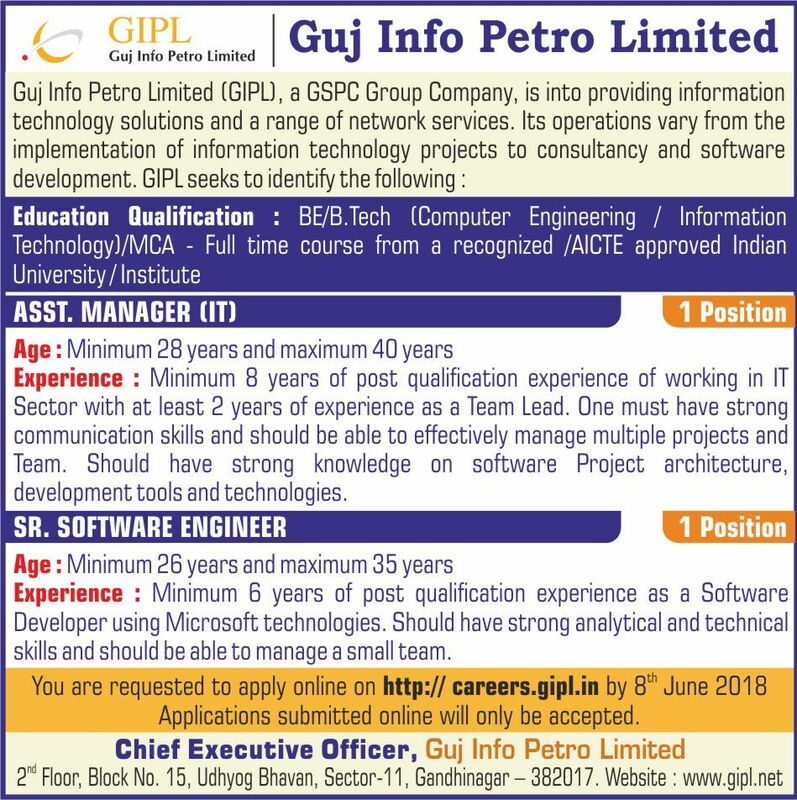 GIPL – Guj Info Petro Limited has published notification for Recruitment for Assistant Manager (IT) and Senior Software Engineer Post 2018. There are 02 vacant seats are available. Application mode is online. Interested candidate can apply online through official website – careers.gipl.in. Interested candidates are requested to apply online through official website before the last date. For more details related to GIPL check official website of it. You can check more details like educational qualification, selection process & how to apply in below given official notification. Guj Info Petro Limited (GIPL) has published an advertisement for Recruitment for Software Engineer, System Analyst, SQL DBA and Graduate Engineer Trainee Posts 2018. Guj Info Petro Limited (GIPL) is a GSPC Group Company. It Provides Information Technology Solutions and a Range of Network services. There are 09 vacant seats are available. Application mode is online. Interested candidate can apply online through official website – www.careers.gipl.in. Interested candidates are requested to apply online through official website before the last date. You can check more details like educational qualification, selection process & how to apply in below given official notification. Water and Sanitation Management Organization (WASMO) Gandhinagar has invited applications for Recruitment of the Deputy Manager, Senior Manager and Assistant Manager Posts 2019. There are 36 vacant seats are available. Application mode is offline. Interested candidate can send their application form to given address as per required documents are given in Advt. before the last date. The last date to send an application to WASMO is 25th March 2019. For more information related to WASMO check official website of it. You can check more details like educational qualification, selection process & how to apply in below given official notification. Water and Sanitation Management Organization (WASMO) has published an advertisement for the Recruitment of Assistant & Assistant Manager Posts 2018. There are 05 vacant seats are available. Application mode is offline. Interested candidate can send their application form to given address as per required documents are given in Advt. before the last date. For more information related to WASMO check official website of it. You can check more details like educational qualification, selection process & how to apply in below given official notification. Water and Sanitation Management Organization (WASMO) has published notification for Recruitment for District Coordinator Posts 2018. There are 25 vacant seats are available. Application mode is offline. Interested candidate can send their application form to given address as per required documents are given in Advt. before the last date. For more information related to WASMO check official website of it. You can check more details like educational qualification, selection process & how to apply in below given official notification. The Water and Sanitation Management Organization (WASMO) has published notification for Recruitment for Assistant Manager (Technical) Posts 2018. Advertisement No. for the given post is 744/18-19. There are 42 vacant seats are available. Application mode is offline. Interested candidate can attend Walk-in-interview with required documents at given address at a sharp time. For more details related to WASMO check official website of it. You can check more details like educational qualification, selection process & how to apply in below given official notification. Water and Sanitation Management Organization (WASMO) has published an advertisement for Recruitment for Manager Posts 2018. There are 10 vacant seats are available. Application mode is offline. Interested candidate can attend Walk-in-interview with required documents at given address at a sharp time. Selected candidates have to sign 11-month of contract as per the rules of an organization. For more details related to Water and Sanitation Management Organization check official website of it. You can check more details like educational qualification, selection process & how to apply in below given official notification. WASMO Career: For human beings, their lives are the most important for them. That is why we all take much care of our health and body, right? For that, we prefer to take healthy food, but only food is not enough for most of the part of our body made of water. So, more than food, water is important. Obviously we consume only pure drinking water but unfortunately, there are still many rural areas in India where people are not even able to get pure drinking water. However both central government and state government taking steps in this direction to make sure everyone get drinking water in every area of the country. We are proud to say that state like Gujarat has started the mission of providing drinking water in rural areas of Gujarat. The government of Gujarat has specially established an organization for the management of water and sanitation. Name of this organization of the government of Gujarat is Water and Sanitation Management Organization. People know it with abbreviated name WASMO mostly. Being a human we all know both water and sanitation is how important for our lives. It is indeed performing very well duties for who are not even able to get drinking water or sanitation. We really appreciate WASMO for this. Let’s get know more about this organization, its activities, strategy, Water and Sanitation Management Organization recruitments and more here. We will start first with the short description about the organization. It is an independent assisting association that is established by the government of Gujarat in the year 2002. WASMO works towards drinking water security and home improvement. It works by allowing the people to manage their local water sources, drinking water supply and environmental sanitation in the state. It was established as a Special Purpose Vehicle (SPV) to make easy the people in the development of water supply facilities in rural areas of Gujarat. It is registered as a society under the Societies Registration Act, 1860 and also as a Public Charitable Trust. For WASMO Recruitment and other details, you can visit the site. Reaching drinking water security through a combination of local and bulk water supply systems. Encourage the people to take on best practices in local water resource management. Irrigating the existing knowledge gap amongst the people on water resource management, safe drinking water, and sanitation issues. Create a strong knowledge base in the water and sanitation sector. Give power to the people to plan, manage, maintain and own their water supply and sanitation facilities. Make sure participation of the people and women in managing their own water supply. There are many offices of them at various places in Gujarat. If we talk about the organizational structure of WASMO then below image will give you more idea about it. Just take a look below for the same. Based on this structure and Position Water and Sanitation Management Organization Jobs are depended. As shown in above image, Governing Body heads WASMO. Governing Body is the top command and control body. It has set up a number of committees with outside resource persons to improve the simplicity of its functions. There are basically two committees. One is Executive Committee and another is Personnel Committee. Obviously, to make successful such a big mission, they need enough staff for technical and administrative purposes. That is why they timely announced WASMO recruitment for various posts. On the official website of www.wasmo.org interests candidates can able to view detailed information about recruitments along with eligibility criteria and more. For further information, one can contact WASMO on the given address, phone numbers and email address on the website. Gujarat State Police Housing Corporation Limited (GSPHCL) Gandhinagar has published a notification for the Recruitment of Company Secretary Post 2019. There are 01 vacant seats are available. Application mode is offline. Interested candidate can send their application form to given address as per required documents are given in Advt. before the last date. Interested candidates are requested to send an application on or before 30th April 2019. You can check more details like educational qualification, selection process & how to apply in below given official notification. Gujarat State Police Housing Corporation (GPHC) has published notification for Recruitment for Dy. Architect and Assistant Draftsman Posts 2018. There are 03 vacant seats are available. Application mode is offline. Interested candidate can attend Walk-in-interview with required documents at the given address at a sharp time. For more details related to GPHC check official website of it. You can check more details like educational qualification, selection process & how to apply in below given official notification. Gujarat State Police Housing Corporation Ltd. has published an advertisement to invite applications for Civil Engineer and Electrical Engineer recruitment. Total numbers of vacancies are 102. Eligible candidate can apply for this State Government Company job through official website of OJAS Gujarat Govt. GSPHC recruitment for engineers is the best opportunity for engineering students. B.E. in civil or electrical with minimum 50% or more marks from a recognized University is the main requirement of this job. You can check more details like educational qualification, selection process & how to apply in below given official notification. Selection Process: Eligible candidates will be intimated separately for date/time and venue of the written test. Interested candidates may apply online for Gujarat State Police Housing Corporation jobs through the official website of ojas.gujartat.gov.in. Gujarat State Police Housing Corporation Ltd. (GSPHC) has published an advertisement for Recruitment for Data Entry Operator, Accounts Clerk and Engineer Posts 2018. There are 06 vacant seats are available. Application mode is offline. Interested candidate can attend Walk-in-interview with required documents at given address at a sharp time on 06 June 2018 at 10:30 am to 02:00 pm. Selected candidates have to sign 11 months of contract as per the rule of GSPHC. For more details related to GSPHC check official website of it. You can check more details like educational qualification, selection process & how to apply in below given official notification. National Mission for Sustainable Agriculture (NMSA) Gandhinagar has published an advertisement for Recruitment for Consultant for District Level Post 2019. Application mode is offline. NMSA has organized an interview for the given post on 08th March 2019 for selection of candidates. Interested candidate can attend Walk-in-interview with required documents at the given address at a sharp time. You can check more details like educational qualification, selection process & how to apply in below given official notification. National Mission for Sustainable Agriculture (NMSA) Gandhinagar has published notification for Recruitment for District Level Consultant Post 2018. NMSA is establishing for enhancing agricultural productivity especially in rainfed areas which focusing on integrated farming, water use efficiency, soil health management & synergizing resource conservation. Advertisement No. of the given post 1534/18-19. Application mode is offline. Interested candidate can attend Walk-in-interview with required documents at the given address at a sharp time. For more details related to National Mission for Sustainable Agriculture check official website of it. You can check more details like educational qualification, selection process & how to apply in below given official notification. State Model Ayurvedic College Gandhinagar has published a notification for the Recruitment of Yoga Specialist Post 2019. Application mode is offline. Interested candidate can attend Walk-in-interview with required documents at a sharp time. Interested candidates can attend an interview on 12th March 2019 at a given address. Candidates are requested to come with the required documents to attend an interview of the given post. You can check more details like educational qualification, selection process & how to apply in below given official notification. Gujarat Fiber Grid Network Limited (GFGNL) has published a notification for the Recruitment of Manager Projects (Districts) Post 2019. There are 01 vacant seats are available. Application mode is offline. Interested candidate can send their application form to given address as per required documents are given in Advt. before the last date. The last date to send an application form is 18th March 2019. For more information related to GFGNL check official website of it. You can check more details like educational qualification, selection process & how to apply in below given official notification. Gujarat Fibre Grid Network Limited (GFGNL) Gandhinagar has published an advertisement for the Recruitment of General Manager (Project) Posts 2019. There are 01 vacant seats are available. Application mode is offline. Interested candidate can send their application form to given address as per required documents are given in Advt. before the last date. The last date to send an application form is 06th March 2019 for interested candidates at GFGNL. You can check more details like educational qualification, selection process & how to apply in below given official notification. Gujarat Fiber Grid Network Ltd. (GFGNL) Gandhinagar has published notification for Recruitment for General Manager Post 2019. There are 01 vacant seats are available. Application mode is offline. Interested candidate can send their application form to given address as per required documents are given in Advt. before the last date. For more information related to GFGNL check official website of it. You can check more details like educational qualification, selection process & how to apply in below given official notification. Gujarat Fibre Grid Network Ltd. (GFGNL) has published notification for Recruitment for Manager Post 2018. There are 03 vacant seats are available. Application mode is offline. Interested candidate can send their application form to given address as per required documents are given in Advt. before the last date. For more information related to GFGNL check official website of it. You can check more details like educational qualification, selection process & how to apply in below given official notification. Gujarat Fibre Grid Network Limited (GFGNL) has published notification for Recruitment of General Manager Post 2018. There are 01 vacant seats are available. Application mode is offline. Interested candidate can send their application form to given address as per required documents are given in Advt. before the last date. For more information related to Gujarat Fibre Grid Network Limited check official website of it. You can check more details like educational qualification, selection process & how to apply in below given official notification. Satsang Shiksha Parishad has published a notification for the Recruitment of Principal, Professor, Associate Professor, Assistant Professor, HOD, Lecture and Lab Assistant Posts 2019. There are 67 vacant seats are available. Application mode is offline. Interested candidate can send their application form to given address as per required documents are given in Advt. before the last date. The last date to send application is 18th March 2019 to the given address in Advertisement. You can check more details like educational qualification, selection process & how to apply in below given official notification. Swarnim Gujarat Sports University (SGSU) has published a notification for the Recruitment of the Vice Chancellor Post 2019. Application mode is offline. Interested candidate can send their application form to given address as per required documents are given in Advt. before the last date. Interested candidates are requested to send an application form within 15 days of Advertisement published to the SGSU. You can check more details like educational qualification, selection process & how to apply in below given official notification. Swarnim Gujarat Sports University – SGSU has advertised for the post of Professor & Chief Coach 2017. There are 08 total vacant places for the mentioned posts. The application mode is offline. Candidates have to send their application along with necessary documents to the below-given address. For more information visit the official website. You can check more details like educational qualification, selection process & how to apply in below given official notification. Interested candidates may send their application along with necessary documents to the below-given address. SGSU Recruitment: Swarnim Gujarat Sports University is established by the state government – Government of Gujarat (GOG). SGSU is an Indian state of Gujarat University located in Gandhinagar. The University was established in the year 2011. The University plays an important role in providing human resources for the development of sports in Gujarat. The university is known for providing career-oriented courses in Post Graduate, Under Graduate, Research Programs and much more. Swarnim Gujarat Sports University is known as SGSU – an abbreviation form of the university. SGSU JOBS also offer career-oriented various posts such as Assistant Officer, Finance Officer, Assistant Professor, Associate Professor, Sports Coach, Teaching and Non-Teaching Posts, etc. candidates who are willing to make their career with SGSU; here is a great chance for you. Apply for the latest SGSU Post by visiting the official website. The official website of Swarnim Gujarat Sports University (SGSU) is sgsu.gujarat.gov.in. Check the official website for upcoming and current openings of Swarnim Gujarat Sports University Recruitment. To check the current openings visit the above-given link. By doing this it will redirect you to the home page of the university. On the home page, there is a ‘Latest News’ section. All the latest SGSU Advertisement is given in that section. To view, all the openings click on ‘View All’. A list of all the current openings, results of previous exams, eligibility list of various SGSU Job Posts, etc will be displayed on the resulting page. Find the one for which you want to apply for the post. Read the official Swarnim Gujarat Sports University Career Recruitment Notification of that post. Check whether you are eligible enough or not for applying for the Swarnim Gujarat Sports University Post. If you are eligible then apply for the job. The application mode of Post is mostly offline. Candidates need to download the form from the website and after filling it send to the given address in the notification along with necessary documents. That’s it. Visit the official website for more detailed information about SGSU Jobs. Gujarat Skill Development Mission (GSDM) has published a notification for the Recruitment of IT & MIS Consultant, Skill Development Consultant and Monitoring & Evolution Consultant Posts 2019. There are 10 vacant seats are available. Application mode is offline. Interested candidate can send their application form to given address as per required documents are given in Advt. before the last date. Interested candidates may send an application on or before 15th March 2019. You can check more details like educational qualification, selection process & how to apply in below given official notification. Gujarat Skill Development Mission (GSDM) has published notification for Recruitment for Consultant Posts 2018. There are 02 vacant seats are available. Application mode is offline. Interested candidate can send their application form to given address as per required documents are given in Advt. before the last date. For more information related to GSDM check official website of it. You can check more details like educational qualification, selection process & how to apply in below given official notification. Gujarat Skill Development Mission (GSDM) has published notification for Recruitment for Consultant Post 2018. There are 01 vacant seats are available. Application mode is offline. Interested candidate can send their application form to given address as per required documents are given in Advt. before the last date. For more information related to GSDM check official website of it. You can check more details like educational qualification, selection process & how to apply in below given official notification. Gujarat Skill Development Mission (GSDM) has published an advertisement for Recruitment for Consultant Posts 2018. There are 13 vacant seats are available. Application mode is offline. Interested candidate can send their application form to given address as per required documents are given in Advt. before the last date to the name of MD, Gujarat Skill Development Mission, Gandhinagar, Gujarat. You can check more details like educational qualification, selection process & how to apply in below given official notification. Eligible and Interested candidate can send their application form as per given format with required documents before the last date to the name of MD, Gujarat Skill Development Mission, Gandhinagar, Gujarat.